1. Austin Badger says that on 4 July 1819 “a long pole was cut and stuck in a shallow beech stump where the old courthouse now stands, and on its top streamed a gloriously and unrivaled in the air a bandanna handkerchief, being the best facsimile of the nation’s flag that could be found and used so the courthouse was not built yet. 2. Old Court House was built by Kidder of Akron. John Freese and Timothy Doane completed it in 1826. 3. When Rev. Barnes became the first regular pastor of the Congregational Church in 1827, the group of parishioners began meeting consistently at the Court House on the Medina Square. Oviatt and Bronson built a 2-story, 4-room addition in the Old Court House Bldg. in 1830 for $690. 4. In 1841 the Old Court House Gable and fancy cupola was removed to fit surrounding buildings. The builder of new court house got the cupola as partial payment. In 1841 the building was purchased by Judge Samuel Humphreville when the courthouse was moved. 1. Samuel Humphreville was born Feb. 7, 1808, in Lonesboro, Berkshire County, Massachusetts. About 1840, he came to Medina and entered into the practice of law. At the age of 43 he represented Medina County in the constitutional convention of 1850. 2. Next, he was elected Judge of the Court of Common Pleas for this district, going on the bench in February. 1852, and serving a term of five years, he being the first judge elected in the district after the adoption of the constitution of 1850, which was the second convention of the state of the constitution of 1850, which was the second convention of the state. The code practice of law dates from this convention. 3. Prior to about the year 1850, Judge Humphreville was a Democrat, and was elected to the above-mentioned offices by his Democrat constituents, among whom, he was a leader. But when the rebellion of the slave states became inevitable, he joined the Re-publican party and as a member of that party represented this senatorial district in the general assembly of Ohio for the period of three years, beginning 1862. He was next elected a member of the third constitutional convention, which met in May, 1873. 4. Judge Humphreville was married to Eliza Sargent, who was the first white child born in Medina Township. Hedied on Feb. 4, 1881, at the age of 73. 1. Having sold out to Carlos J. Warner all my stock except ready-made clothing and having to vacate the store Monday next, I offer my whole stock of ready-made clothing at almost your own prices regardless of cost. 2. P. C. Parker is putting six new stone hitching posts, a platform and chains in front of the courthouse. 1. D. H. Bachtell purchased the grocery stock of Hubbard and Curtis in 1877. 2. Arthur VanEpp purchased the groceries and fixtures of the D. H. Bachtell Store in the Pauli Block and moved into the Wood Building in 1894. 1. 1881–"W. H. Hobart and A. J. Blackford have gone into partnership in the tin and stove business and have bought a business home of their own." 1. 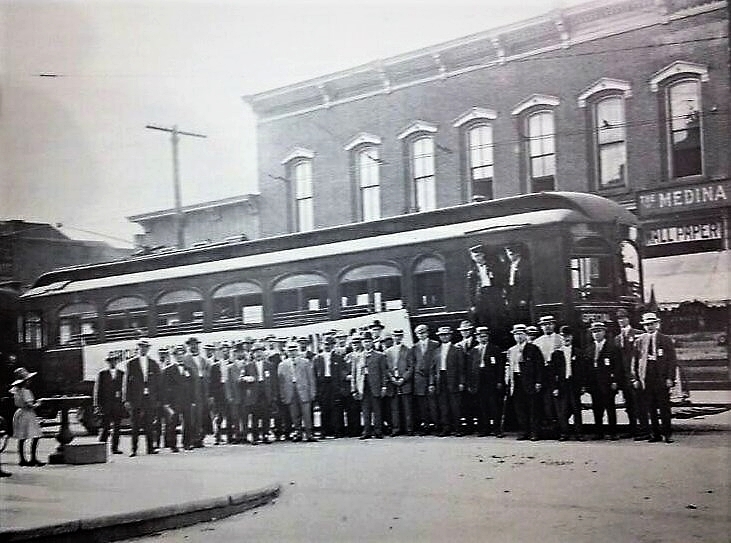 Organized in 1895, the Cleveland Medina & Southern Electric planned to build an electric railway line from Berea through Medina to Chippewa Lake Park, a growing amusement and recreation park, and eventually to Wooster. By December 1900, the CM&SE had franchises and private rights-of-way stretching from Berea to Wooster. 2. The Pomeroy-Mandelbaum Southwestern System: 1900 to 1931. Companies include: Cleveland, Medina & Southern Electric Company (1900-1902); Cleveland & Southwestern Traction Company (1903-1906); Cleveland, Southwestern & Columbus Railway (1907-1923); Cleveland, Southwestern Railway & Light Company (1924-1931). 3. The Pomeroy-Mandelbaum properties consolidated on January 21, 1903, to form the Cleveland and Southwestern Traction Company (C&SW). The new company created two divisions, Western and Southern, and operated a total of 120 miles of completed track, with twenty-six miles under construction at the time of consolidation. It operated two power stations and thirty-three motor cars between Cleveland and Medina to the south and Oberlin, Elyria and Wellington to the west. 4. By September 1903 the Southern Division line through Medina reached Wooster. 5. Another factor that stunted expansion of the C&SW line involved a major downturn in the national economy. 6. The tremendous growth in passenger traffic after 1900 enjoyed by the Pomeroy-Mandelbaum line declined sharply starting in 1903 and did not pick up again until 1906. Although the road continued to see some growth in operating revenues, primarily from gains in freight revenues, the stagnant passenger traffic enticed the syndicate to wait out the recession. 7. The C&SW carried passengers to Chippewa Lake in Medina County. This park served the recreation needs of neighboring rural towns and villages, as well as a more affluent patronage than the urban parks. The Southwestern did not own the Chippewa Lake Park resort, but gained from its popularity with Northeast Ohio residents. 8. Besides the excursion and Sunday traffic, the "Green Line" benefited from seventy or more Cleveland families that spent their summers at cottages along the lake, leaving the "man of the house" to travel daily back and forth to work. As the Southwestern promotion claimed, "At this resort the busy man or woman finds restoration of strength and buoyancy of brain and body which are required to meet successfully the demands of modern life." Considering Chippewa Lake Park's appeal to the upper middle class, one could describe it as a resort for Progressive Era Yuppies. 10. In 1911, Thomas S. Brennan conducted a restaurant in the CSW&C station when the electric railroad occupied the corner room of the Hobart Block. 1. W. H. Hobart is giving his Stove and Tin Store a thorough overhauling and renovating, by papering and painting it. When completed it will present a very fine appearance. It is one of the finest stores in town and is filled with a large and varied assortment of stoves. 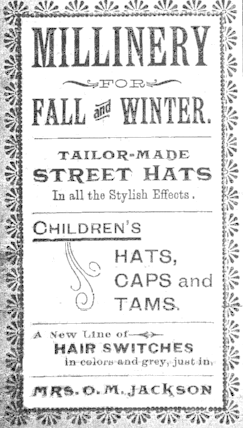 and other supplies in 1886. 1881-Samuel Humphreville died and left the building to three daughters; Mrs. H. H. Brainard, Mrs. S. F. Jones and Mrs. D. E. Welch. 1. In 1897, the Old Courthouse called the Humphreyville Block was built up to two stories and extended 8’ to the rear. 2. In 1897, a new large plate glass window and a vestibule doorway was added to the Humphreville Block. 1. In 1888, Henry Paull sold his Grocery and Provisions Store to Wotring and Damon who will move their candy stock into the Old Court House Block and continue the grocery and provision trade. 2. The Humphreville Block (#2 and #4) on the west-side of the Public Square has been sold to H. A. Paull of Middletown, Ct. to whom possession will be given in a few days in 1897. 1. Mrs. Jackson has been in the millinery business for over 43 years and has won a high reputation among Ladies of this town as a leader of the fashions. 1. Jennie Paull sheathed the Paull Building in tin in 1912. W. H. Hobart bought H. A. Paull Bldg. (#2-4 Public Square) in 1913. Building vacated for fear of collapse in 1913. 1. Short orders only, no dinners served. 1. Mrs. Mary K. Long and her late husband, James, moved to Medina in 1892 when they purchased the Medina Sentinel Newspaper. James passed away in 1913. 3. The post office will move into its new quarters In the Hobart block corner of Court street and West Liberty Saturday evening. The work of moving will commence at 7 o'clock, the hour for abutting up shop and it is expected that the labors will all be completed by 10 o’clock. In fact there is not much to move, only the books, records, mail and equipment. The only furniture to go to the now quarters is the safe, which went on ahead, and a few pieces of rural free delivery stuff which is owned by Uncle Sam and which will be stored In the base- ment. All the other furniture is own by the McDowell’s, proprietors of the block in which the post office has been located for so many years. 4. All of the furniture in the new office is brand-new put in by the owner of the Hobart block, W.H. Hobart. The new office is one of the best equipped offices in the smaller cities of the country and is a model for beauty and convenience. It is .expected that the office will open Monday morning in complete running order with no probabilities of any hitches anywhere. 1. Mr. Young served in the 8th United States Army for eight years being discharged at the end of the Spanish-American War. 2. He worked in the Medina Bending Works after leaving the Army until 1910, when he was elected sheriff of Medina County and was re-nominated without opposition in 1912 and re-elected. 3. After leaving the Sheriff’s Office, he again entered the employ of the Medina Bending Works until appointed Deputy United States Marshal in 1921. 4. Allen E. Young became Postmaster of the Medina village on September 1, 1922 on the removal of Mary K. Long for cause, who had held the office during Democratic administrations for seven and one-half years. 5. His nomination was sent to the Senate by President Warren G. Harding and his commission for first term was dated December 22, 1922. Mr. Young was re-appointed by President Coolidge in January, 1927. Allen E. Young passed away in February, 1929 and was succeeded by Acting-Postmaster William E. Gates. 6. The lighting plant in the dry goods store where the Post Office is in 1922 exploded and blew out the plate glass windows. 7. The Post Office had been painted green when it was moved here in 1916, but and now it is painted yellow in 1922. 1. E. H. Tintsman relocated his electric supply business to #228-236 South Court Street in 1933. 1. Mr. Hatch moved his dairy store to #111 West Liberty Street in 1930. 1. In 1943, the building front was burned by a thrown cigarette and the plate glass window cracked. The fire also caused damage to Tubbs Insurance Agency upstairs. 1. Grady Finch leased the Hobart Block from the estate of Frances ‘Fannie’ (Mrs. W. H.) Hobart. Finch is operating a five-cent to $1 store. Mildred and Milton J. Hayes “Five and Dime Store" sold to Lillian and Grady Finch and it became "Finch Five and Dime”. 2. Grady Finch will add new store front in 1946. 3. In 1961, Grady Finch sold the building to investors, Erwin and Nedra Ziegler Eastwood. 1. Harold “Whitey” Thwait opened the Medina store in 1949 two doors down from here and moved to #2 Public Square in 1958. Son Jim began to work there at age 13 and in 1973 took bus from Strongsville and opened store on Saturdays. Store front added awnings in 1953. 2. 1963 - Whitey’s will remain as tenant of #2 Public Square. Tin facing removed and bricks sandblasted, trim painted and bricks repointed. Building built as courthouse in “1826”; this renovation will not destroy its Early American appearance. 3. For 67 years, Whitey’s Army Navy store has been a fixture in Medina’s Historic Town Square, but Friday, June 26, owner Jim Thwaite announced that he is closing the store. Founded in Medina Ohio and locally owned and operated by Jeff and Melissa Miller, Courthouse Pizzeria has a core mission of always being a strong community supporter. We focus our philanthropic efforts towards our schools and the special needs of our families and friends. We all need help at some point, and our best days are those that we are able to help make someone’s day a little better. 1. When Reverend. Barnes became the first regular pastor of the Congregational Church in 1827, the group of parishioners began meeting consistently at the Courthouse on the Medina Square. 1. He had shops and stores in the old Empire Block and all along the business street at various times, but is listed in the Old Court House building for simplicity and where he maintained his store after being burned out in 1870. 2. Blackford employs two hands making boots and shoes for annual sales of $8,000 and sales of other rubber products for $1,600 in 1872. 1. His son, Jeb A. Hobart worked in the business as a clerk. The Humphreville Block in the west-side of the Public Square has been sold to H. A. Paull of Middletown, Ct. to whom possession will be given in a few days. (1897). 1. Mrs. Eberly also had a Millinery Shop in the Store. 1. Samuel took over the jewelry business on the death of his father Herbert H. Brainard in 1910. 2. In 1931, Brainard’s jewelry accepts wheat receipts at 50 cents per bushel. Brainard’s sells Buckbee-Brehn silhouettes and matting pictures. 3. The First radio receiver installed in Medina was in this store in 1936. 4. Brainard Jewelry Store closed after 65 years in 1936. 1. This well-known ice cream store was remodeled in 1949. 1. We carry a large inventory of gold, silver and estate jewelry, coin supplies and we appraise. 1. Dr. Tolman has disposed of all the stock in-trade and will hold himself in ready at all hours for professional calls. 1. Dr. Smith moved his practice to the Smith Dental Block at #28 Court Street in 1867. Vacated by F. E. Edward’s Dry Goods Store in 1900. 1. Tubbs Insurance Agency remodeled and doubled the size of 2nd floor offices in 1931. 1. James B. Palmquist purchased the building from the estate of Erwin Eastwood in 1976.